If there’s one language we Western North Carolinians speak, it’s beer. With over 40 breweries tucked into our mountains and valleys, you might think that it’s a saturated industry, but the beer scene is constantly evolving. Case in point: the BottomsUP Box. Conceived in 2014 by then-college student Alex Freeman and fostered by professor Ralph Griffith of Lenoir-Rhyne University’s Center for Commercial & Social Entrepreneurship, BottomsUP Box is the answer to every beer aficionado’s hop-scented prayers. After watching tipsy patrons surreptitiously pocket pint glasses at breweries, Freeman hatched the idea. 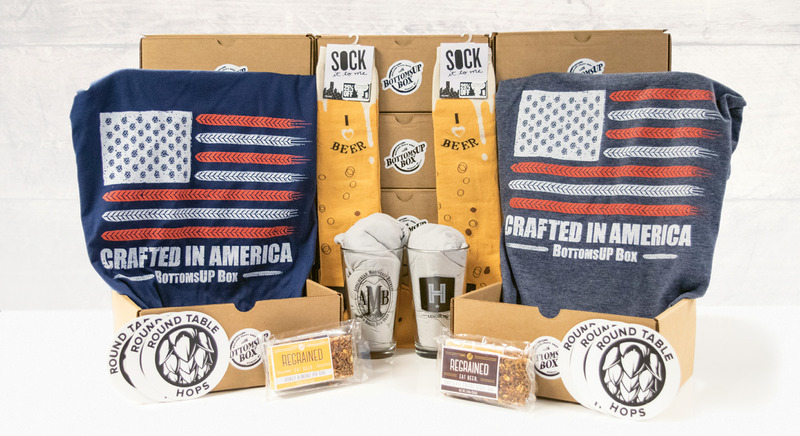 Now, his Hickory-based craft beer accompaniments and apparel subscription service helps small breweries and beer accessory companies get their swag into the palms of beer lovers everywhere. Tucked inside each box—they’re released quarterly—you’ll find a piece of apparel (usually a trendy T-shirt designed in-house) and glassware, as well as three to five other items, from one-off leather koozies to witty bottle openers. BottomsUP Box was a start-up born from our local sentiment for suds, but it’s quickly become a national vehicle for small business growth, prompting craft beer connoisseurs to explore new breweries and companies. Now that’s something we can cheers to. Sign up for the quarterly subscription ($115 for the year) or just snag the latest box (for $35) at www.bottomsupbox.com.